Isaiah 53:5 But he was wounded for our transgressions, He was bruised for our iniquities;the chastisement of our peace was upon him, and by his stripes we are healed. WOUNDED=plégé in the greek and mean a blow, wound, stripe; an affliction, plague. TRANSGRESSION=paraptóma in the greek and mean a false step, a trespass. A falling away, lapse, slip, false step, sin. This old testament text foretells the TRUTH of what would happen to Jesus after having put on flesh and coming to earth to live among humanity. We are reminded in this text of His purpose for coming. He came to suffer and die for humanity and not for any sins of His own, but for you and I who willfully sinned against God and transgressed against His law. Yes, God in His love and mercy for humanity sent His Son Jesus to earth to take our place on the cross at Calvary by shedding His blood as full payment for our sins. Jesus suffering and death brought about our healing and reconciliation back to God the Father. Adam, our first father, brought about death for all of humanity, but Jesus, through the shedding of His blood brought about life for all of humanity. Romans 5:18 Therefore just as through the trespass of one man came condemnation for all men, so through the righteous act of One came justification of life for all men. Jesus was whipped, spat on, beaten and pierced with a thorny crown on His head, pierced with nails in his hands and feet and hung on a wooden Cross as a vile criminal. Jesus was crushed and bruised for you and I. Yes our horrible, deserving punishment was accepted by Him and placed upon Him because of His love for us. Yes, Jesus took it upon Himself to take on our disease called "sin" so that we can live. He took on mockery, ridiculed, publicly abuse and shame, humiliation and eventually death by murder for us in obedience to His Father's will. 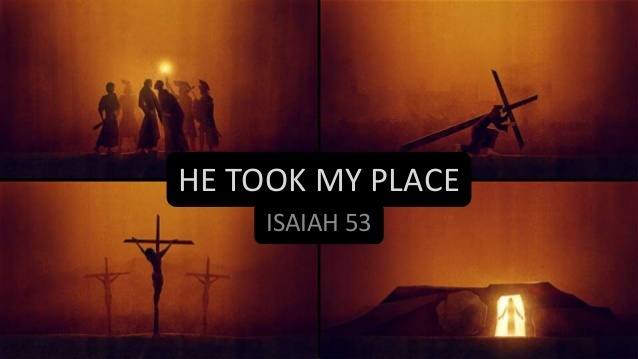 Jesus took our place! He did it just for us! What are you doing that shows evidence of your gratitude for what Christ did for you in dying for your sins? Scripture declares that "by His stripes you are healed". Because of what Christ did at Calvary in giving His life in exchange for yours and mine, you can be born again. Jesus death at the cross is "LOVE" that can not be described or fully comprehended, but, it is a "LOVE" that MUST be embraced by ALL of humanity. Our sins for His RIGHTEOUSNESS! Oh what an exchange! Jesus alone has the power to heal you and I and make us whole again! People of God open wide your mouth and proclaim these words in worship to the Lord your God: JUST FOR ME, JUST FOR ME. Keep saying it out loud and I know without a doubt that God through His Holy Spirit will show up immediately and visit you. Just for me! Jesus came and did it just for me! I do not own any pictures or videos on this site nor do I claim ownership of them.